I very much enjoyed this collection of Gothic and creepy stories originally released in the 1940's. I generally prefer short tales that pack a punch, and these are definitely not that. However, they often have a good deal of humor and that sense of atmosphere in which I love to wallow. A VISITOR FROM DOWN UNDER was, for me, a beautifully told ghost story/tale of revenge. PODOLO A nice little day trip to the island of Podolo takes a nasty turn. This one reminded me that feral cats may not be worth the effort. 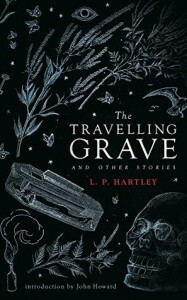 THE TRAVELLING GRAVE was quite the funny story involving a misunderstanding involving perambulators. (Is that word even used anymore? It's a shame if it's not because it's a word that rolls nicely off the tongue.) Anyway, the humor of the situation quickly changed to horror at the gruesome ending. Always be careful playing hide & seek! CONRAD AND THE DRAGON I wasn't sure what to make of this fairy tale like...tale. It didn't have the usual fairy tale ending, but I found it to be totally charming. THREE OR FOUR, FOR DINNER was another tale involving some humor and a practical joke gone wrong. This was my first experience with L.P. Hartley and I'm so glad I gave this collection a try! Recommended!